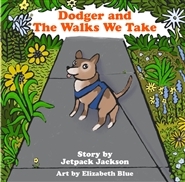 Dodger & The Walks We Take is a genuinely written and charmingly illustrated picture book about a dog and his friend journeying city streets and urban forests while living on the edge of downtown. Based in the mid-sized Pacific Northwest town of Eugene, Oregon. Words by Jetpack Jackson. Art by Elizabeth Blue.